Spillville | Winneshiek County Development, Inc. Photograph taken by Joyce Meyer Photography. With a population of roughly 360, Spillville is a village originally founded by a German, which eventually grew into a refuge for Czechs. This small Czech village became a retreat for composer, Antonin Dvorak. Today, Spillville is still that special place, nestled among the soft rolling hills of the Turkey River Valley. A dedicated community of families strive to preserve the rich history, heritage and Czech culture. Spillville has an exceptional firework show every year over the fourth of July weekend, the Inwood Ballroom, beautiful for wedding receptions and dances, a locally run campground and other great outdoor activities that are enjoyable for the entire family. 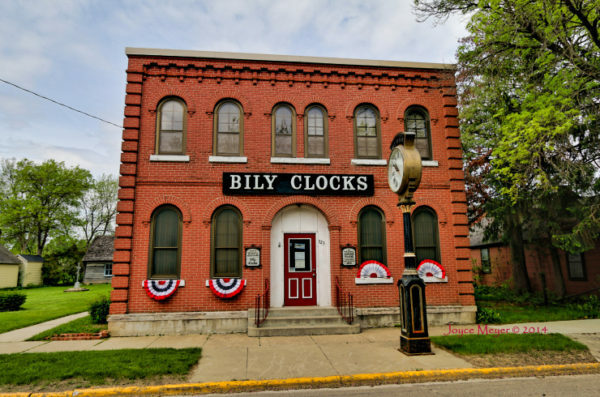 It is also the home to the Bily Clocks Museum, unique clocks that two brothers, Frank and Joseph Bily (bee-lee) hand-carved. The clocks depict history, art, religion and culture and are covered with hundreds of expertly carved figures. Some stand over nine feet tall. For more information about the City of Spillville, visit their website.